In the eyes of a child, still learning to see—or the memories of a grown woman, still fighting to see differently—the tenement’s warring factions are as important as the mafioso at the funeral Mass, or the shooting of fireworks on a Neapolitan rooftop. So it is in My Brilliant Friend’s most striking sequence, set in an apartment block’s dusty courtyard. As our narrator, Lenù (Margherita Mazzucco), and her co-conspirator/co-protagonist, Lila (Ludovica Nasti), look on, Lidia Sarratore and her husband’s mad mistress, Melina Cappuccio, perform their private drama for the groundlings below. The neighbors gossip and snipe from balconies strung with fresh laundry, and between cuts, the camera turns, following their voices; occasionally, the image returns to the girls on the street clutching their dolls, heads swiveling to hear the chorus. By the time the dispute erupts in a brutal staircase fight, its chaos of pleas, insults, and awful blows finally causing Lenù to faint, director Saverio Costanzo has constructed a sequence worthy of Rear Window: Elena Greco is our L.B. Jefferies, her eyes our telephoto lens. Unsurprisingly, the response to HBO’s adaptation of Elena Ferrante’s sublime novel, the first of four in her “Neapolitan cycle,” has been rather muted. After all, the lives of two girls in midcentury Naples, poor strivers hoping to escape the fates of Lidia, Melina, their maestra, their mothers, are not the raw materials of the Internet’s next obsession. Even critics’ largely positive reception of the series reads as restrained, often reluctant, whether born of ardor for Ferrante’s writing or an exceedingly narrow definition of “enthralling” direction: In the most telling of the “favorable” reviews I consulted, a Russian nesting doll of barbed criticism and faint praise, The New Yorker’s Troy Patterson describes the “humble tenderness” “beneath the show’s heavy coats of operatic varnish and prestige-TV enamel,” like an archeologist dusting off bones at Pompeii. As Paste’s Amy Glynn notes, echoing much of the discourse surrounding the adaptation, certain elements of Ferrante’s My Brilliant Friend are necessarily lost—impossible to capture—in the transfer from page to screen, namely Lenù’s fleeting reflections and recollections, her precision of language, which in the TV series assume the clumsier form of voiceover narration. This seems to me both a fair assessment—the series does not, perhaps cannot, replicate the experience of reading My Brilliant Friend, its commanding lightness, its forceful naturalism—and a fruitless point of comparison. Though the aforementioned reviews discuss the leads’ sterling performances, the period detail, the pacing, the plot, there’s vanishingly little attention paid to its cinematic grammar—the composition of the image, the movement of the camera, the placement of the cut—which more closely approximates one’s inner monologue, one’s specific point of view. Along these lines, My Brilliant Friend displays an intoxicating mastery of perspective: It’s a series in which nearly everything important that happens happens across courtyards, in stairwells, around corners, between rooms—in other words, telescoped by the characters’ position in the world, in all of the ways that might mean. As such, Costanzo’s direction—perhaps as a result of their close collaboration on the project—reflects Ferrante’s own sense of perspective as limited, blinkered, often obscured. In the series there are silvers of a man’s beating, glimpsed through a crowd of mourners who’ve fled the church to gawk; teenage Lenù (Margherita Mazzucco) and Lila’s (Gaia Girace) dual views of the domineering Solara brothers harassing girls in the square; a swift, fearsome arrangement of young men on the attack, framed in the window of a bus. As Lenù, much older, promises in the opening scene, My Brilliant Friend is not only the story of what she saw, but also of what she knew, of what Lila told her, of what she inferred, hoped for, surmised: For Costanzo as for Ferrante, watchfulness is not a form of omniscience, but of understanding—and in that it’s always finite, flawed. My Brilliant Friend even features an attempt, imperfect but wholehearted, to reconstruct these epistemological strata, to find images to match the novel’s heady admixture of the first person and the “close” third. And so, though Lenù’s narration suggests that the story is hers to tell, Costanzo’s camerawork counters that it is not hers alone: After the Solaras intervene to help Lila’s brother, Rino (Gennaro De Stefano), and his friend, Pasquale (Eduardo Scarpetta), in a brawl with some Neapolitan prepsters, it’s through Lila’s eyes that we briefly glean a softer impression of Marcello (Elvis Esposito); at other moments, the pairing of an image with the turn of her head signals, as in that courtyard conclave, that we, and perhaps Lenù, are privy to Lila’s point of view, the way intimate friends often hit upon the same idea at the same time. The technique is inconsistent enough that it reads as an idea in gestation, not yet in full flower, but when it comes through most confidently, it’s rich with possibilities, especially considering the characters’ longer periods of separation in the subsequent novels. See “The Island,” for instance, which follows Lenù on Ischia with the Sarratores—until Lila’s “horrible stories” arrive by letter, that is, and we’re transported back to Naples as if Lenù were envisioning the events described. The series is at pains to draw what Lenù calls their “dissolving margins,” and it does so with a deftness not necessarily equal to Ferrante’s, but at least feels worthy of it—a rough translation of thought into image, and a deeply alluring one. 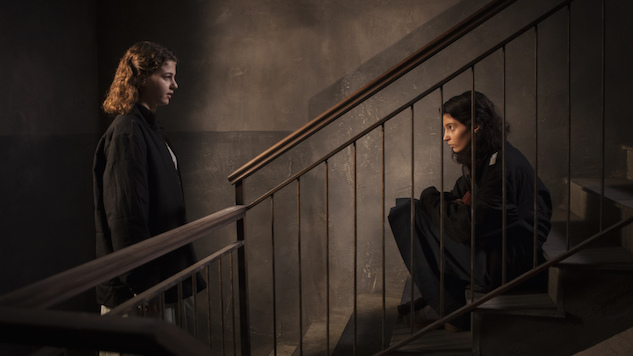 In labeling its direction “bland,” then, or encased in “prestige-TV enamel,” a number of My Brilliant Friend’s critics appear to miss, or at least misconstrue, the most important element of the series’ aesthetic: its thoroughgoing belief that position, perspective, matters, and that any change thereto—continuing in school or leaving it, getting married or remaining single, standing at a remove from the action or leaping headlong into the scrum—can ripple down the years in ways none of us can predict, or expect. “When you’re where you shouldn’t be, there’s always trouble,” Rino says to Lila after that melee in “The Shoes,” arguing the traditionalist’s case. “On the page there was exactly what I had written, but clearer, more immediate,” Lenù observes, as if to rebut him, in the forthcoming season finale, after Lila edits an article she’s drafted for a small political magazine. “The erasures, the movements, the small additions gave me the impression that I’d escaped myself.” That this is also adaptation’s ideal—immediate exactitude—is likely no coincidence, and if HBO’s My Brilliant Friend fails to achieve it, it’s at least worth noting that it recognizes what it’s striving for. As it grows, I hope the series keeps fighting to see differently, for that is when its vision takes flight. My Brilliant Friend airs Sundays and Mondays at 9 p.m. on HBO. The series has already been renewed for a second season.